Numerous authority figures are entrusted with your loved one’s care – most of them a fraction of their age. If you can’t be a physical presence for your loved one what will you do to bridge the gap between physical absence and an effective long distance presence? My mother and my daughter, circa 1976. My father was diagnosed with Alzheimer’s at the age of 84 and died in 2007 at the age of 89. By the time of his diagnosis he had been living in a Continuing Care Retirement Community (CCRC) for seven years. His wife, my mother, died a month before they both were to move to this CCRC located in Oregon state. My mother was truly looking forward to the move with my dad but on September 24, 1994, she was granted the wish that she had thrown into the universe many years earlier – that when her time came, she wanted to die in her sleep. My father still moved to the Oregon CCRC because at the age of 77, he knew he still had a valid reason to move there. Both he and mom didn’t want to be a burden to us three children, so moving into a retirement community that would meet all the needs of his aging body and mind was dad’s gift to us. Dad, myself, and his wife Barbara on his 87th birthday. A few years after my mother’s death, dad married a resident of the CCRC and they had a wonderful late-in-life marriage. 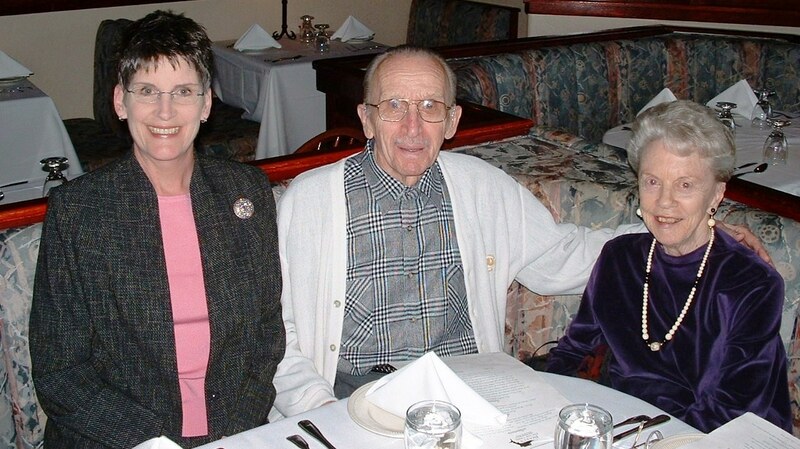 Dad’s wife, Barbara, died from complications of Parkinson’s in 2003 so once again, dad became a widower, but this time his biggest challenge was that he was in the early stages of Alzheimer’s disease. He was still able to live semi-independently in an assisted living apartment at the complex and he was able to perform his activities of daily living (ADLs.) Of us three adult children, the job of being dad’s caregiving team leader quite naturally fell to me. I had worked in the senior care industry for several years so I was quite familiar with caregiving lingo and body frailties, not the least of which was Alzheimer’s and other dementia. 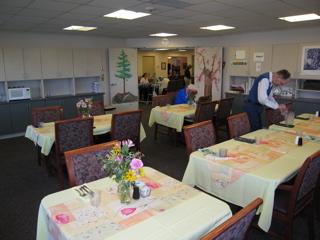 Dining room at my father's facility. Initially, the miles that separated us wasn’t all that challenging. He was still active, was fully capable of getting himself up in the morning, taking his medications, getting to the dining room, etc. Us children would call dad frequently – and he still had the ability to call us – and we continued our visits throughout the year and although his dementia was obvious to us, we knew he was in good hands and that he was functioning quite well. The staff was very attentive to him and if they had concerns, as his health care representative and financial power of attorney, they kept me abreast of the latest, the greatest, and the ever-increasing not-so-greatest. The not-so-greatest happened one frightful evening. Dad called me telling me that he felt very agitated and he couldn’t stop walking around his apartment; he couldn’t settle down; he didn’t know what was going on. I asked him if he had recently taken any medication and he replied, “Just some cough syrup.” “How much did you take?” “I don’t know.” So while I had my father on my home phone line, I called the front desk of the facility on my cell phone and told them that my father was having an emergency in apartment #94 and a nurse needed to get there immediately. I kept my dad on the phone and told him that a nurse was on the way to see him and that he would be taken care of very soon. The nurse arrived quickly, and the emergency was averted. Bottom line? We now knew that dad was no longer capable of managing his own medications. He took way too much cough syrup that evening and it caused his heart to race, resulting in extreme agitation. This precipitating event was the start of his noticeable decline and medication management became the first ADL for which my dad needed assistance. The above example barely scratches the surface of what many of you are dealing with. Your long distance eyes and ears seem thoroughly ineffective and you’re concerned about your loved one’s well-being. 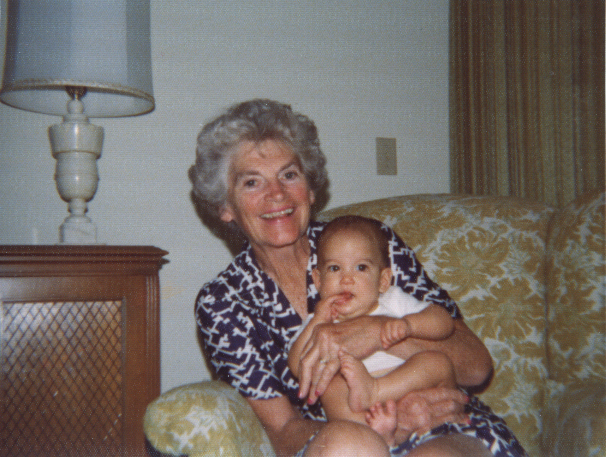 There is hope for the long distance caregiver. It’s not the same as being there, but this hope somewhat bridges the long distance caregiving gap. Part II of this article, published December 4, 2011, addresses some practical steps you can take to help in your caregiving journey. This entry was posted in Alzheimer's/Dementia, Caregiving, Family issues, Health & Wellness and tagged Alzheimer's, caregiving, dementia, long distance caregiving, medication challenges with the elderly. Driving with dementia: the dangers of denial.